Join us for “Songs & Storytime,” a free, experiential preschool class for parents and their children (ages 2-5). Stop in for a fun Saturday morning play date and see for yourself what children experience in our Early Childhood classrooms, including play time, circle games, and a vivid and engaging story, told with the help of handcrafted table puppets. 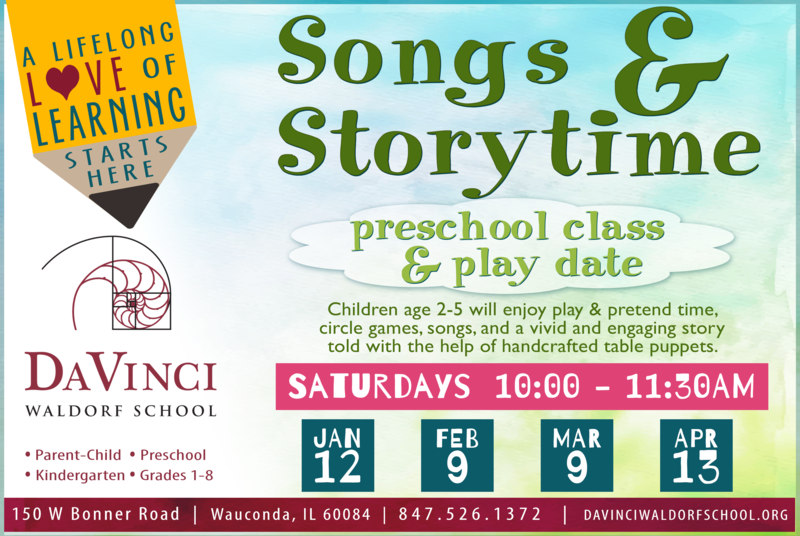 Songs & Storytime - Quick RSVP <— CLICK TO RSVP or Call (847) 526-1372. Request an individual tour any time—just Contact Us or give us a call at (847) 526-1372. All are invited to tour or sample our school! There’s a world of discovery ahead for your child, and Da Vinci Waldorf School is the perfect path to begin exploring it. Whether your child is in preschool, kindergarten, or grades 1-8, our programs offer outstanding preparation for your child’s happiness and success in the future. Learn more.